"At its July meeting, the NCTM Board of Directors decided that effective January 1, 2018, in order to create synergies on staff and among volunteers and reduce expenses, that all full-time NCTM employees would be located in the Reston, Virginia office. The decision to consolidate all NCTM staff in Reston was not purely a financial one, but was made for other business reasons as well, including the potential positive energy The Math Forum staff could have brought to the focused work of the departments at NCTM headquarters in Reston. 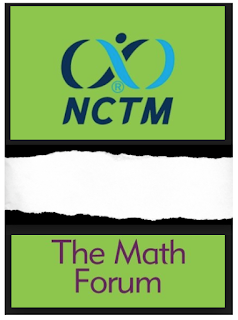 Math Forum staff elected not to continue their employment with NCTM. The Board of Directors is very disappointed in this outcome, but NCTM is pleased to have been able to extend the Math Forum’s existence after Drexel ended their relationship with The Math Forum. We thank each and every member of the Math Forum for their commitment to mathematics education and hope each of them reconsiders their decision to leave NCTM." (Read entire post written by Matt Larson & Robert Berry.) Also, read this Twitter post. This is truly unfortunate (in my humble opinion). The Math Forum has always been a well-spring of fresh ideas. Yes, this is indeed a sad turn of events. I listened to the webinar by Matt Larson last week. Does not seem that anyone is feeling good about how this played out. I too feel bad for the Math Forum. They had a very comfortable situation and they helped a lot of teachers at conferences. But I liked the old Math Forum when they were doing those "radical" CWACs in the 90s well before NCTM had any strong interest in computer labs. Hopefully they will rediscover their roots and come up with something interesting in the future.